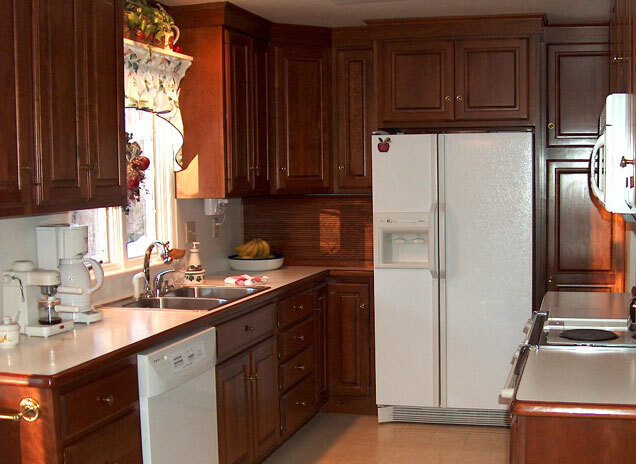 One of the most frequently used countertop surface materials is plastic laminate. 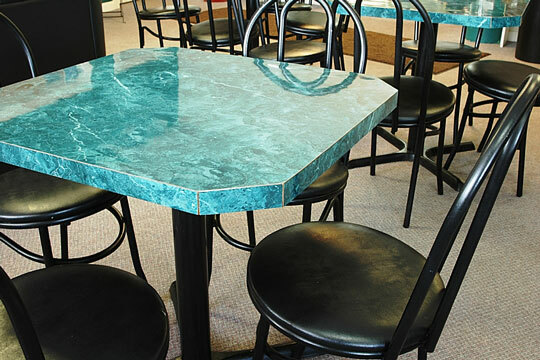 Plastic laminate surfaces are durable, affordable, and available in a wide variety of patterns and colors. After the Formica Corporation was founded in 1913, plastic laminate was used mainly in the electrical industry as an insulator, in cars and radios, and then later for furniture. After 1927, when a method of lithographing designs on the surface was developed, laminate became popular for use as restaurant and bar countertops. Until that time, laminate was only available in black or brown. But with the new decorative designs marketed after World War II, builders began to use it in the home market. Today, if you want a real retro look for your kitchen countertops, use the earlier classic plastic laminate designs. Add a chrome edge and voila — retro 1950s! Plastic laminate is made by bonding together melamine, paper, and plastic resin layers, using a high temperature and pressure process. The finished laminate is then bonded to a plywood or particleboard base to form the countertop. The laminate can even be contoured to match the countertop shape. The resulting surface material resists water, stains, and some abrasion. But it can be scratched or chipped by sharp objects, and damaged or scorched by hot pots and pans. Damage to plastic laminate materials cannot be repaired. Damage will not show so much on the solid-core laminates, and maybe you can just live with it; but to fully fix a laminate countertop, replacement is the only option. Use cutting boards and trivets to protect this countertop material. Plastic laminate countertop choices are almost limitless. There are dozens of colors. Patterns are available to mimic wood, stone, metal, or even leather. The surface finish may be smooth, textured, glossy, or matte. Most countertops have either square or rolled edges, but the edges may also be beveled or have materials such as wood, solid surface materials, or metal incorporated into them. Check out the various grades of laminate. There are more expensive laminates such as solid-core or color-through types. On these laminates, there are no black edges like those found on other laminates. While these solid-core laminates can be layered and routed with designs, color and finish options are limited. Built-in antibacterial protection is also available from some manufacturers. Generally speaking, higher grades of laminate will be more durable and cost-effective choices. 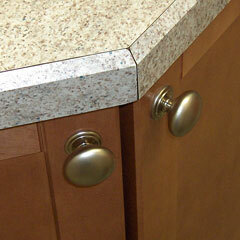 Laminate countertops are durable and easy to clean. Wash them with mild detergent and water, then rinse with a clean cloth. Do not use abrasive cleaners. Wipe up spills quickly so liquids can't seep under any seams where the laminate edges meet. If the underlayment gets wet, it can warp and swell, ruining the smooth countertop. 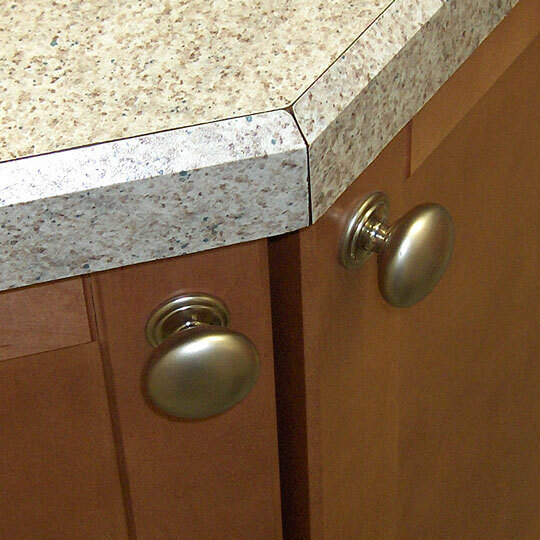 New plastic laminate countertops are an economical way to add beauty and value to your home. Visit the manufacturer websites listed below to view all the wonderful options available. 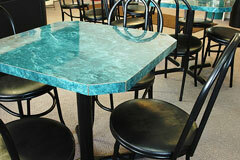 Formica Corporation designs and manufactures a variety of surfacing materials. Wilsonart produces decorative laminate and solid surface materials. Nevamar is a U.S. manufacturer of decorative laminates and specialty laminates. Designs and produces high-quality, durable custom laminates. Manufacturer of high pressure laminates. Offers a wide range of solid-color laminates, as well as various laminates that mimick wood, metal, stone, and other decorative effects. Laminate-Countertops.com. All rights reserved. About Us.